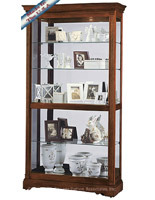 These display cabinets are an ideal method to showcase treasures or other collectibles. They are flexible, able to be hung on a wall or proudly exhibited on a mantel or countertop. 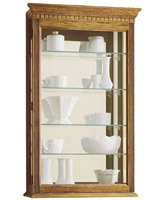 The display cabinets, also recognized merely as curio cabinets, are crafted by the masters at Howard Miller Company. 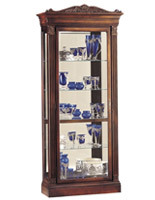 Howard Miller's name stands for unsurpassed quality along with outstanding craftsmanship. 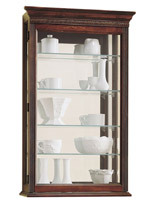 These display cabinets are sure to last for decades and decades, being passed down through a family as heirlooms. 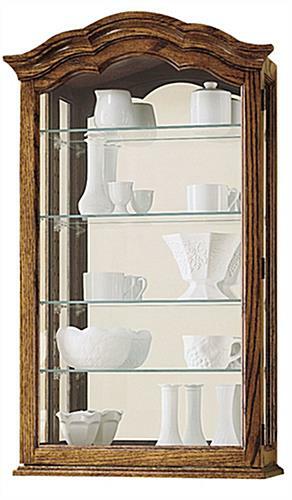 From the legendary Howard Miller Collection, these display cabinets, wall curio cabinets are finished with an Oak Yorkshire stain, to match perfectly in a country home. 20.0" x 33.5" x 8.3"